Just as US President Donald Trump’s first visit to Asia began earlier this week, Japan’s Prime Minister Shinzo Abe consolidated his power by winning a snap election by a landslide on October 22. Abe called for the national election on September 25—14 months before it was due—describing its purpose as to “achieve a breakthrough regarding our national crises.” While mentioning Japan’s aging society and rising tensions with North Korea as national crises, he did not explain the timing. Media speculation was that the administration expected the situation with North Korea to be only exacerbated as time goes on, making it more difficult to hold an election next year. Abe himself later admitted this point publicly. The North Korean leadership sharply responded to the election results claiming that Abe exploited North Korea’s nuclear threat for his political goals by “noisily trumpeting about the story.” To be sure, threats posed by North Korea weighed heavily on the minds of Japanese citizens as they took to the polls. But Abe did not need to “noisily trumpet” their threats to emphasize how important they are to his public. Rather, North Korea’s regular yet ever-more intensifying provocations, combined with their harsh rhetoric to call for Japan to be “sunken into the sea by the nuclear bomb of Juche,” were enough to convince voters that stable political leadership and strong US-Japan relations are necessary for today’s Japan. Abe’s strong and positive relationship with President Trump reinforced this trend. Prime Minister Abe’s repeated victories in elections since December 2012 indicate the public’s overall support for his leadership in the face of regional challenges. The landslide victory for Abe’s Liberal Democratic Party (LDP) and its coalition partner, the Komeito, has secured a super majority in the Lower House, which allows the ruling coalition to pass constitutional amendment proposals for national referendum on top of general bills that only require a majority of votes. Abe has now added four years to his mandate and will become Japan’s longest serving prime minister since World War II. Post-election opinion polls conducted by various conservative- and liberal-leaning media outlets indicate the Abe Cabinet’s high approval rating (54% by Nikkei/TV Tokyo, 52% by Yomiuri, 49.5% by Kyodo, 42% by the Asahi). All were a 4-11% improvement for Abe from previous surveys. Despite such high approval ratings, Abe opened his first press conference after winning the election on a rather cautious note. “Keeping in mind my serious responsibility, I will earnestly run the administration based on a humble approach and a stable coalition base.” Here’s why. Abe’s strong and long-term leadership comes at a price. A primary worry among many is that uncontested long-term leadership with weak opposition parties might build the arrogance of the leadership and increase the potential for abuses of power without sufficient checks and balances. A pre-election poll indicated, for example, that 47% of the public viewed Abe’s continued time in office as undesirable, 10% more than those who thought it was desirable. 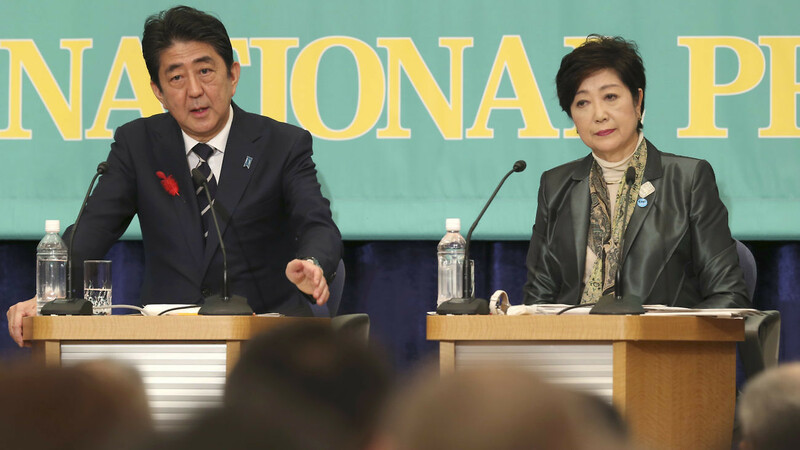 Post-election polls further revealed the public’s ambivalence over the possibility of Abe staying in office until 2021—with near splits between those in favor and those against in three separate polls. Abe himself seems to understand this dilemma—especially in a context where he is facing relatively weak opposition and enjoys comparatively strong unity within his party—and strives to exhibit some degree of self-monitoring to help convince the public that he is not taking his power for granted. After his approval rating plummeted in July following a series of scandals, he reshuffled the cabinet and started his press conference with a candid apology for causing distrust. He stressed the importance of “going back once more to the starting point five years ago when [his party] regained the reins of government” and making “every effort to respond humbly and conscientiously to the mandate given to us by the people.” In absence of strong pressure by the opposition parties, what reminds the LDP of the severe consequence of losing the public trust is the rather traumatic experience of having lost control of power in 2009. Abe learned this lesson more severely than anyone as a once-failed prime minister in 2007. Opposition parties have been trying to create a strong counterforce against Abe for years and further accelerated their efforts in advance of this snap election. Their realignment was triggered by the creation of a new party, the Party of Hope, which was followed by the split of the largest opposition party, the Democratic Party, and the creation of another new party, the Constitutional Democratic Party of Japan (CDPJ). These efforts failed to bring about a unifying force, and if anything, only contributed to the LDP’s victory by splitting anti-LDP votes. The difficulty lies in identifying the core opposing value to the pragmatic politics of Abe. Their realignment process will only continue, however, and the desire for creating a strong counterforce against the administration and becoming an alternative voice for the public will continue to drive the dynamic Japanese political scene. Ayumi Teraoka is a PhD candidate at Princeton University. Her research focuses on alliances and Asian security.